(AP) LONDON - Serena Williams relishes her role as copycat little sister. Even if it takes her 12 years. Now, she has that remarkable Olympic double  just like Venus. The overpowering American pair teamed to win the women's doubles title at the Olympics on Sunday, with Serena adding to the singles gold she won on Centre Court at Wimbledon a day earlier. "Crazy," Serena said. "I'm always copying her. I forgot that she did it in Sydney and I do it here. We're the same doubles team, we just split this to singles, so it's cool." The sisters beat Andrea Hlavackova and Lucie Hradecka of the Czech Republic 6-4, 6-4 under the roof on a rainy afternoon at the All England Club. Venus  with her red, white and blue braids pulled back into a bun  closed out the match on the very grass she has long loved with a backhand volley winner after the Czechs saved a pair of match points. "We all talk about this, 'We have so many medals,' but to be able to add to that, it's like an unbelievable feeling," Venus said. "You know that in that count, there you are. It feels amazing." On Saturday, Serena beat Maria Sharapova 6-0, 6-1 for the singles gold. She joined Steffi Graf as the only women to complete the Golden Slam  winning the Olympics and the four majors. When the Americans in the crowd at Centre Court broke into a chant of "U-S-A! U-S-A!" as the players left the court, the sisters each pumped their fists, turned around to wave, then slapped a high-five. The medal ceremony had to wait for the outdoor bronze-medal match, which was delayed by rain. With Bob and Mike Bryan capturing gold in men's doubles Saturday, make it three golds for U.S. tennis in two days. "It's great because America's added three gold medals to our medal count just in the tennis," Venus said. "I feel great to be a part of this U.S. team this year." Serena became tennis' first double gold medalist at an Olympics since Venus won singles and doubles at the 2000 Sydney Games. The sisters also won the doubles gold at the 2008 Beijing Olympics. With Sunday's victory, they each have a record four Olympic tennis gold medals, and the sisters didn't drop a set through their five matches at the London Games. While Serena was thrilled to win on her own Saturday, with Venus rooting her on from the family box, the doubles is what she most cared about coming to the London Games. Especially considering all the emotional and physical struggles for Venus, who was diagnosed last year with an autoimmune disease that causes fatigue. "This is all I wanted," said Venus, who had all of about two months to raise her ranking and qualify for the Olympics. "Boy, was that a battle. That was one of the hardest things I've ever done. I really feel proud of what happened here at the Olympics." But for years Venus has been comfortable on the lawn at Wimbledon, where she has won five of her seven Grand Slam titles. 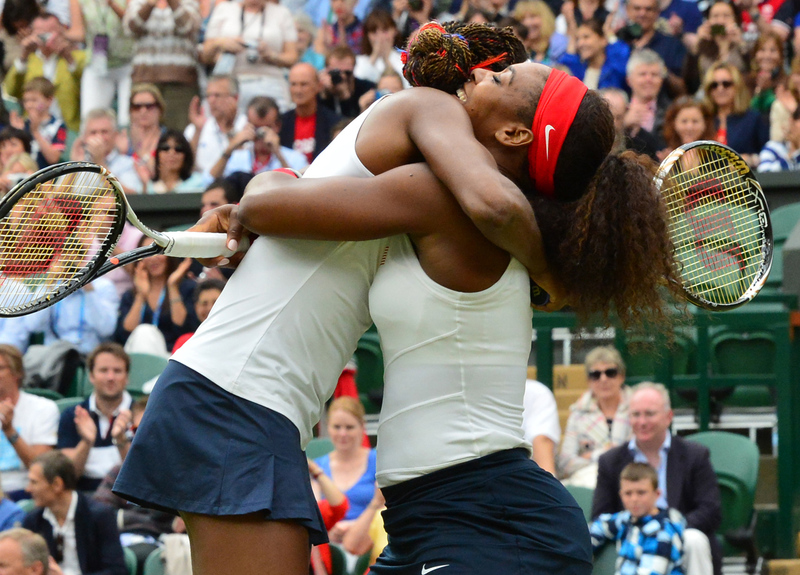 "Venus has been going through so much and she's so strong and so she's so amazing," Serena said. "And to win this was my goal." The Williamses also became the first tennis players to win Olympic gold indoors since the 1912 Stockholm Games, a match played in a pavilion on wood courts painted black. On Sunday, they won the fourth game of the second set at love on Venus' ace, the first of three straight games in which they didn't lose a point. Serena overcame two break points trailing 1-0 in the second set. She pumped her fist and cheered after a forehand winner down the alley past a poaching Hradecka, who was aggressive at the net all afternoon. The Czechs held in four of their first five service games, including Hlavackova's first that went to deuce four times. Venus Williams joins Conchita Martinez of Spain as the only tennis players to win medals at three different Olympics. Martinez's medals all came in doubles  silver in Barcelona in 1992, bronze at the 1996 Atlanta Games and silver in Athens in 2004. Gigi Fernandez and current U.S. coach Mary Joe Fernandez are the only others to win back-to-back Olympic tennis gold medals after they teamed for doubles titles in 1992 and 1996. And the sisters insist they're not done yet. "We're looking forward to Rio," Serena said, "and trying to get some sort of medal there."